I've been raising backyard chickens for about 8 months now and they've been such a treat. We have 3 girls: Pickles, Big Bertha and Fluffy Cheeks. Two of them are Ameraucanas and one is a Rhode Island Red -- different breeds usually lay different colored eggs. Flavor wise, they are the same but it's fun to get a different variety of colors like blue, green, brown and sometimes even pink! Whenever our eggs start stocking up, I love hard boiling them and making egg salads or deviled eggs. I've found fresh laid eggs are often more difficult to hard boil since the fresh whites stick directly to the shell. Older eggs form air pockets between the whites and the shell which makes for easier peeling. With Fall inching her way into Texas, I am already thinking about holiday get togethers. I had these bomb diggity deviled eggs at a steakhouse a few weeks back and loved the presentation of their deviled eggs, I naturally had to follow suit. I like this presentation for a couple reasons: it's more fool proof when it comes to execution, if you happen to rip some of the white during peeling or cutting, it's easier to fix. You can either mask it by piping the yolk filling over it, or simply just trimming off some of the white. It also makes for a more "elegant" presentation and the eggs don't end up sliding around the plate. 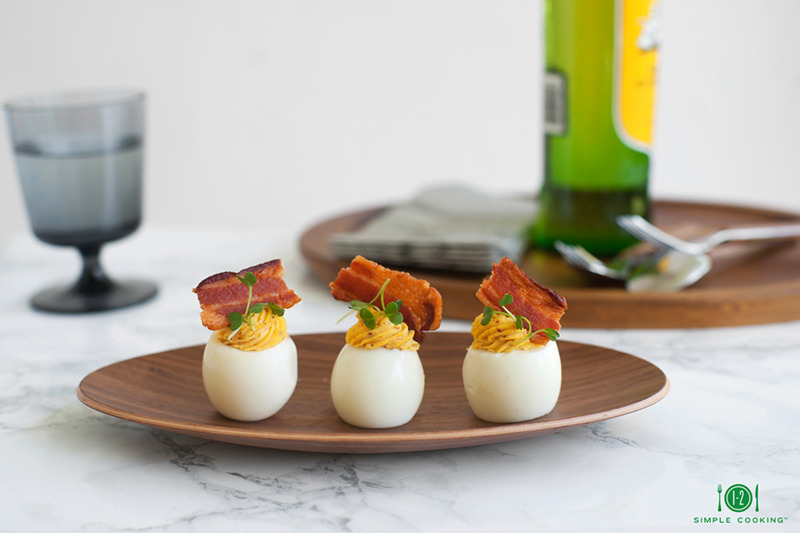 You can switch up the yolk filling to any flavor you desire, but I thought a little Bacon might get the party started. What are some of your favorite flavors for deviled eggs? Place eggs in a large pot and cover with cold water. Place on stove and bring to boil. Turn off heat and leave eggs for 6-7 minutes. Plunge in an ice water bath for 5 minutes. Peel and set aside. It’s better to use older eggs for deviled eggs so they’re easier to peel. Slice off just a sliver off the bottom end of the egg so it’s able to stand up right. Trim about ½” off the top and gently pop out the yolk - be careful to not rip the whites. Set yolks aside in a bowl. Cut bacon slices into 2” pieces and set aside. In large bowl, mix mayo, yogurt, mustard, paprika and lemon juice. Combine with egg yolks until thoroughly mixed. If the mixture is too thick, add a little bit more yogurt to smooth it out. Add a pinch of salt and pepper and taste to your liking. Place yolk mixture in a piping bag with a large star tip. Arrange cut whites on serving platter and pipe yolk mixture in each egg, make sure to pipe an inch to an inch and a half above the white. This makes for better presentation. Top with cut bacon slices and garnish with microgreens. You can replace microgreens with scallions if preferred.